There are some places in the world that, even if you have visited over and over again, you cannot grow bored of. One of these places is for me the rose garden of the Franciscan monastery of Cimiez, in Nice – the city of my Erasmus year. So, when, after coming back from Iran, I met in Nice my friend Irina and her daughter Ema, who were also visiting, I knew I wanted to show them and again go back to Cimiez. It was windy and indeed rain was very close when we entered the garden. That made it quiet and almost deserted. We walked slowly along the alleys, smelling, caressing, smiling. Filling our eyes with the wonderful colors of these beautiful flowers. Breathing in the sweet scent of roses and spring. I must say that I love all flowers, but that, in general, roses are among my least favorite. There is too much marketing, there are too much everywhere and, most of all, they often seem so fake, so stiff and fixed – the perfectly fake natural flower. But Cimiez is the exception. Maybe because here the roses are alive, flowing around you like colored waterfalls. Maybe because the silence in this garden gives you the feeling that you are walking not in just-another-park, but that you are entering a sacred space. I let myself move slowly and without direction. Rain indeed came, but left shortly after, letting a little bit the sun shine over us, letting us enjoy a little bit longer the garden and its peace. Eventually we left. And after visiting the Matisse Museum on the way, we stopped in the old city of Nice to rest and close the day. The sun was getting close to set and was looking sideways. Every little thing surrounding us had an aura of light around it – the people passing by, the buildings, the signs on the street, our glasses, the hair of my friend Irina. Sitting quietly, enjoying the sun, barely hearing the muttered conversations of the people in the street, holding little Ema in my arms.. I felt time stopping. And truly and completely blissful. 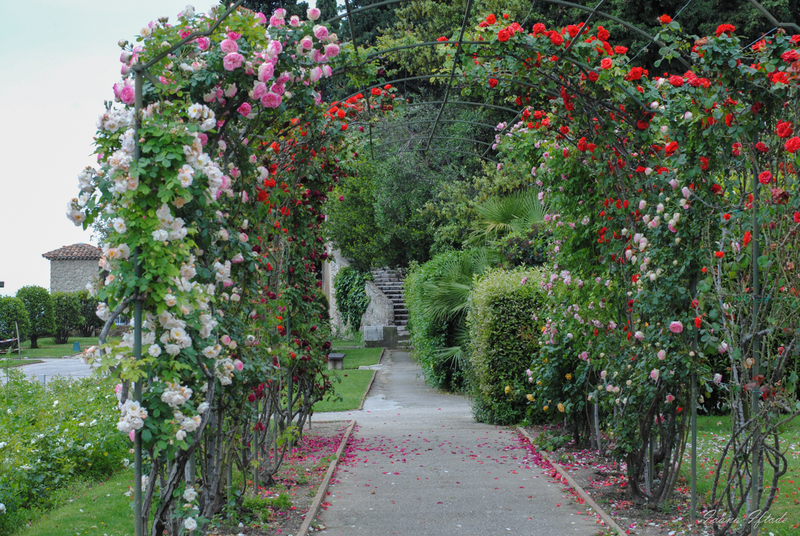 This entry was posted in France, Meditative, Places and tagged cimiez monastery, france, nice, rose garden by Ioana Iftode. Bookmark the permalink.